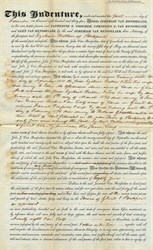 Indenture signed by Jeremiah Van Rensselaer regarding Glen Van Rensselaer; Catharine G. Visscher, Cornelius G Van Rensselaer - 1834 regarding property of Ezekiel Butler. Jeremiah Van Rensselaer was a citizen of New Jersey and was the eldest surviving son of John J. Van Rensselaer.